Today was just a ‘regular’ busy day including a meeting at Chaim Boruch’s school with his physical therapist. 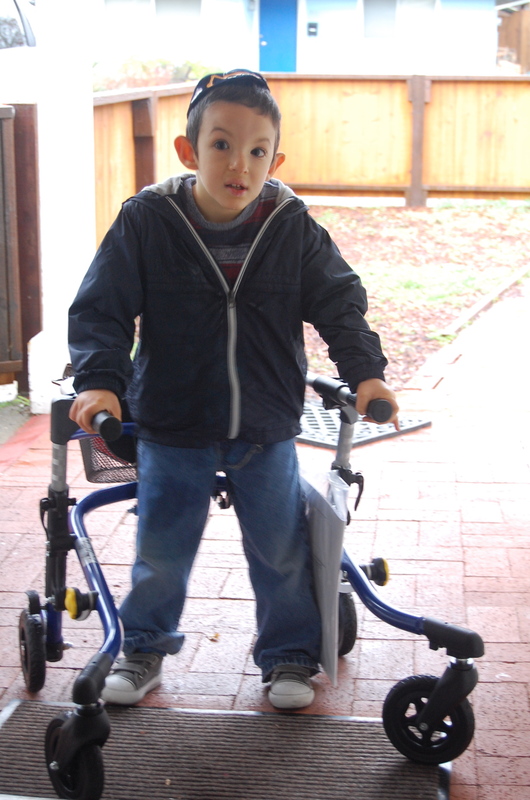 Chaim Boruch wants to walk so badly and we have been trying various types of walkers to see which ones works best. So it has been months of assesing which walker can he hold onto without falling, which walker can he maneuver himself best with and which one would help Chaim Boruch avoid colapsing from his own weight. So today I saw his little shining face , all smiles and happy sounds as he cruised down the big, long hallway. His little body wobbled, legs shaky and feet scattered in many directions. His hands held on with determination and the confidence he had was more than I could ever dream of having in my lifetime. Full of smiles and clearly showing me what he’s been working on for so long. I stood at the end of the hallway cheering him on and telling him how proud I am and that he’s doing great! I felt my heartbeat attached to that walker, as each step he took, it seems to spark my heart beat, giving it life and vitality. Wow, what a moment we had reached…finally it looks like this walker was a winner and so was my child. I thanked the therapist and my husband scooped up our little ‘walking boy’ and headed down the hall back to our car. My eyes welled up with tears and my throat felt tight and dry. It’s these fleeting moments when my eyes see part of reality that maybe I try not notice. Was I crying from my own needs of being a mother that just yearns for a normal day? Maybe it’s the sheer intense love I have for my child, wishing he would not know challenge like he does. “Good night my walking son”.